L 6 1/2″ (17 cm). Description: Sexes similar. Gray above, with gray crest; blackish forehead; and whitish below with buffy flanks. 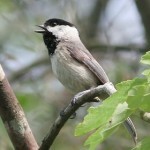 Habitat: Generally found in deciduous or coniferous forests, orchards, woodlots, and suburban areas. Where in Nebraska: In the western edge of its range in Nebraska, the species is confined to bottomland deciduous forest. Common permanent resident in the east, with breeding limited to forested valley of Missouri River, and west along Big Blue River to at least Saline County. 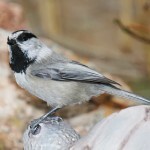 Field Notes: In a race found in Texas, birds have a whitish forehead and black crests. 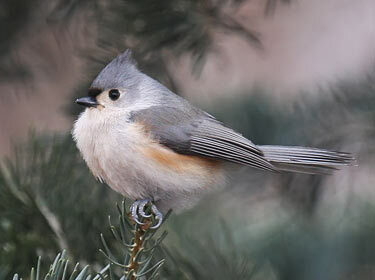 Fun Facts: Tufted Titmice are cavity nesters but cannot excavate their own holes in trees, therefore they rely on holes made by woodpeckers or natural cavitities in dead trees. That is why is so important to leave dead trees standing without salvaging them, because the the Tufted Titmice depend on them for nesting. 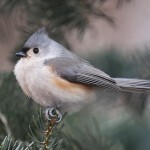 Additional Information: These were formerly considered a separate species, the Black-crested Titmouse.